Eyebright Formula™ - 575 mg, 60 Veg Capsules each (Nature's Wonderland) - Penn Herb Co. Ltd. This targeted blend, created by master herbalists generations ago, supports normal vision. 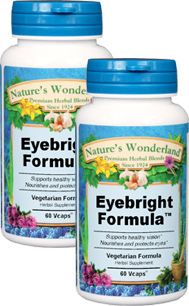 The herbal nutrients in Eyebright Formula help to nourish and protect the eyes. Eyebright… As the name implies, this centuries-old herb helps to maintain healthy eyesight and soothes tired eyes. Herbalists include it in healthy vision formulas because it is a natural source of nutrients such as vitamins A, C, and Zinc, which help to nourish all parts of the optical system. Bayberry, Golden Seal Root…herbal tonics soothe the delicate mucous membranes of the eyes. Cayenne…promotes circulation throughout the body and maximizes absorption. Provides herbal eye nourishment; helps support normal vision; soothes tired eyes. As an addition to the daily diet, take 1 or 2 capsules three times daily with water at mealtimes. SEE LABEL FACTS BOX FOR CAUTIONS.